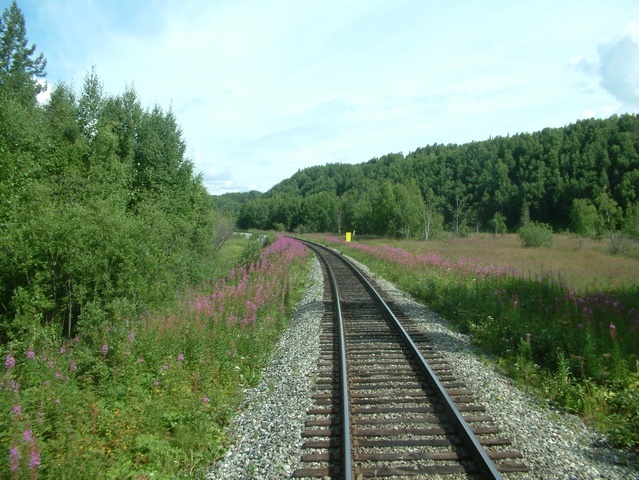 ADVISORY: THIS ARTICLE CONTAINS EXPLICIT PICTURES OF THE ALASKA RAILROAD AND FIREWEED. Fireweed: A tall perennial (Epilobium angustifolium) of the evening-primrose family that has long spikes of pinkish purple flowers. 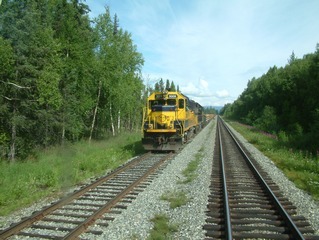 Alaska Railroad: A 500 mile regional railroad connecting Seward Alaska with Fairbanks Alaska completed in 1923. Known as America's only full-service railroad, offering both freight and passenger service year round. My annual trip to Alaska for 2007 marked a return to actually riding on the beautiful Alaska Railroad. 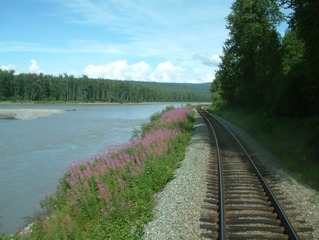 While in Alaska in 2006, I did not get aboard the Alaska Railroad. 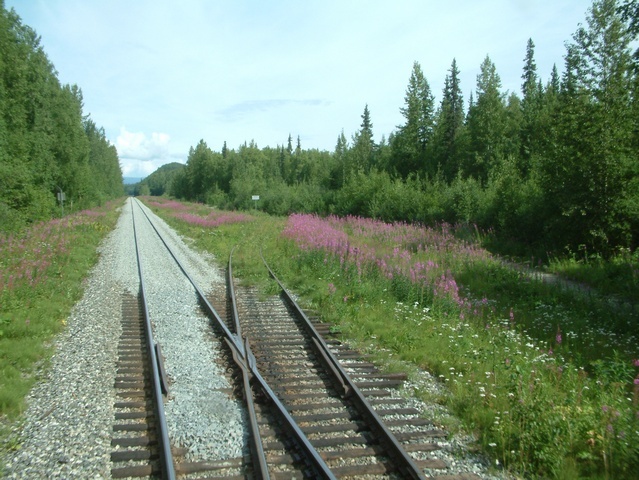 The day before my departure from Long Beach to Anchorage, I got my plan set up to ride the Denali Star train northbound to Talkeetna and then switch to the Hurrican Turn Flagstop train. A good choice this was since the weather cooperated. For the Anchorage to Talkeetna leg of this trip, click here. The Hurricane Turn Flagstop train is the last flagstop train on the North American continent running early May through early September on a Thursday through Sunday schedule. 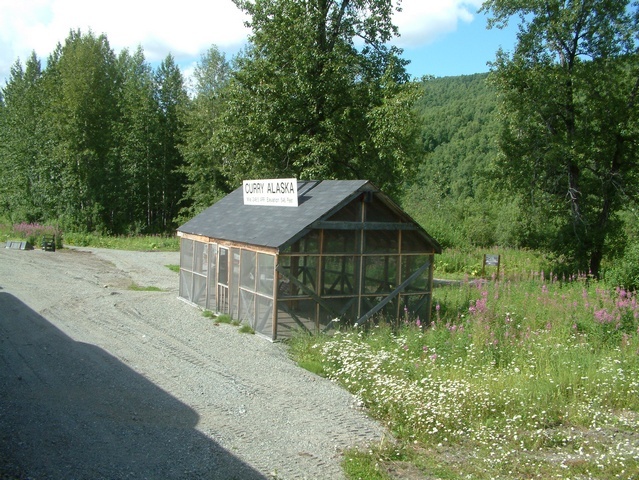 Off season it runs with less frequency. 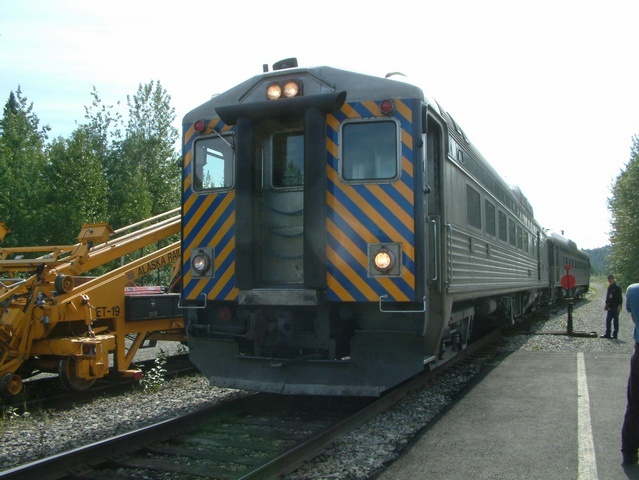 Most years the equipment is 2 RDC cars, though in 2001, the train consist was a Geep and one old gallery car. 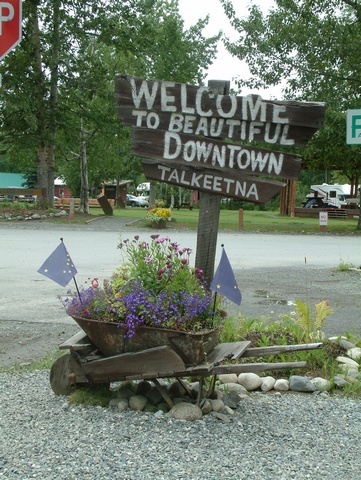 When I arrived, only 2 people were at the Talkeetna Section house. 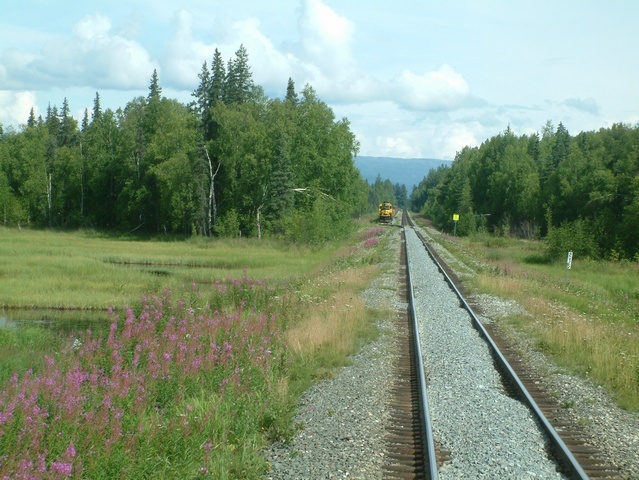 In Anchorage, I had asked about my Hurricane Turn train ticket. 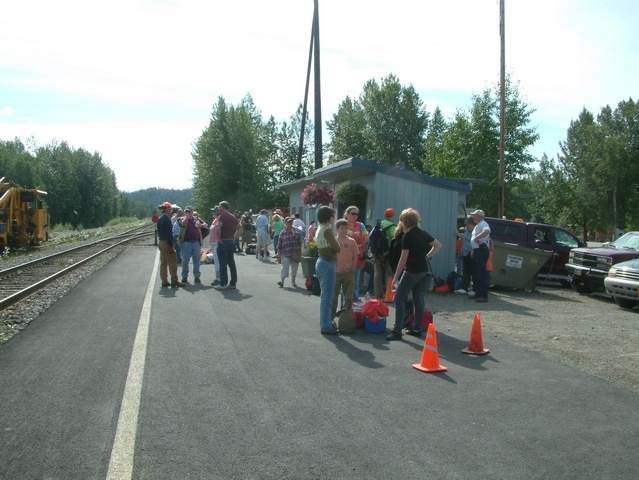 The ticket office person said to see Jack in Talkeetna. After awhile, I noticed Conductor Buddy Gray, had a batch of tickets in his hand. He quickly found mine and distributed the rest to the gathering crowd. 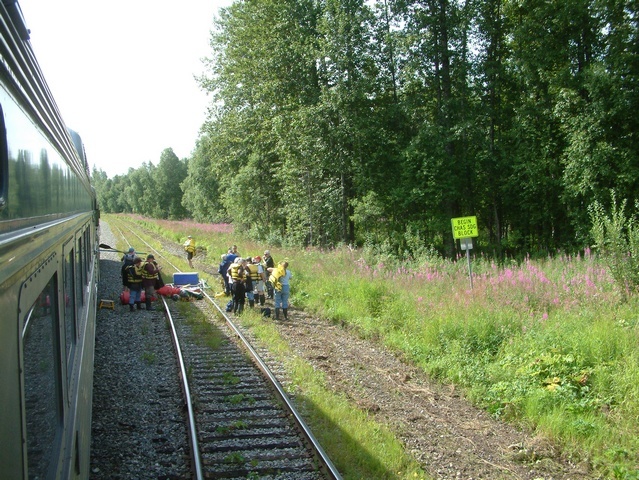 As soon as the northbound Denali Star soon passed by the Hurricane crew moved the train onto the mainline and boarded the passengers, about 50 people, including a number of people going rafting. 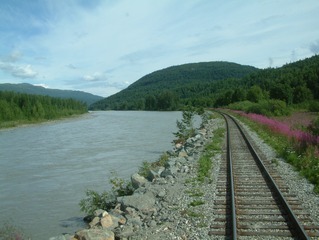 The rafting trip is booked through the Alaska Railroad. Below right, notice the woman in the green shirt. She seemed to be posing for my photograph. We chatted later when I noticed her shirt had ice hockey slogans. As usual on the ARR RDC cars, there was no barrier to the control cab and we soon departed. 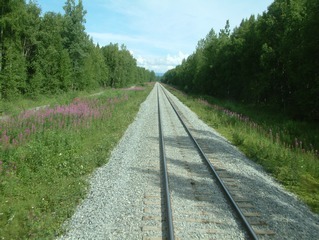 Off we went into the wilderness on the Hurricane Turn, which is always an adventure. This part of the railroad traverses some pristine Alaskan wilderness with such historical names as Curry, Chulitna, Sherman, and Hurricane Gulch, a 918 foot wide chasm. 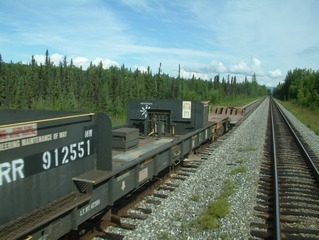 Two kinds of side dump ballast cars are visible. The end of the train has a depressed center flatcar for a large front end loader. "Commitment to dirt" is stenciled on the MOW car. It even has a small blade hanging over the tie end. The Hurricane Turn train is a "flagstop" train, meaning potential passengers near the track can show their intention to board the train by waving their arms or a white flag. 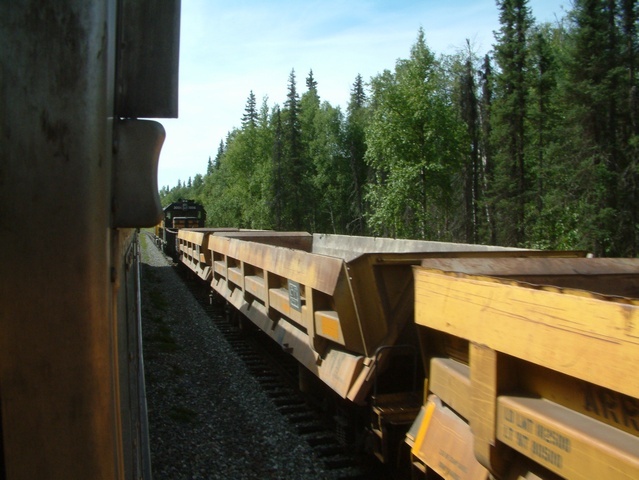 Once he sees them, the Engineer sounds the whistle and informs the conductor which side the flag is going to board. 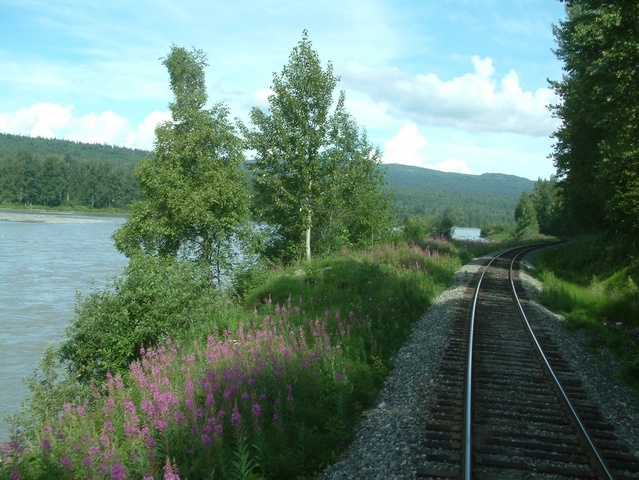 Many people own cabins between Alaska Railroad mileposts 226.7 (Talkeetna) and 285 (Hurricane), the route the Hurricane operates on. The depend on the Alaska Railroad for access to their cabins, since there is no road access in this area between Talkeetna and Hurricane. The stops are made as brief as possible. 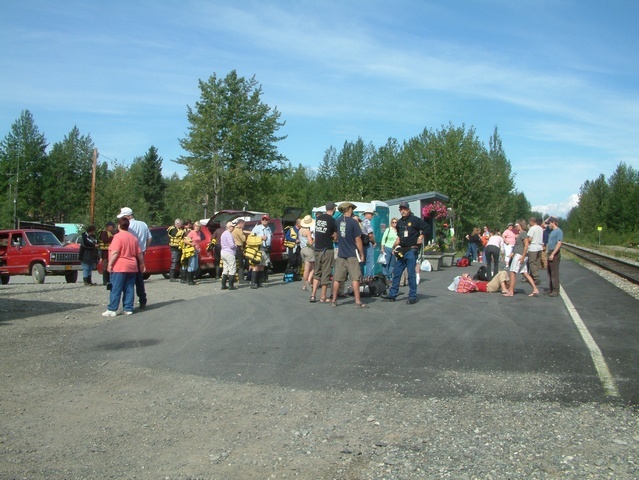 It appears the first flag stop was at milepost 255 to pickup some people heading to Hurricane where there vehicle was parked. The rafters were dropped off at Chase. The Alaska Railroad offers a train ride to Chase and a gentle float trip on the Susitna River back to Talkeetna which takes about 4-1/2 hours. 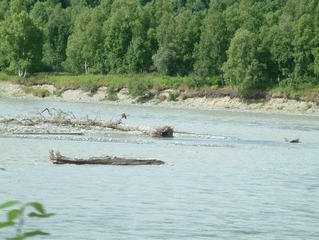 Below right looks like a location which has flooded in the past. 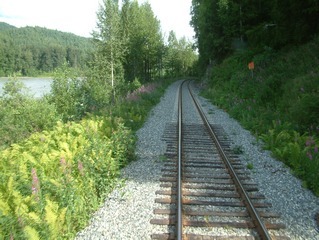 Notice the large rip-rap rocks to the left of the track. While talking to some other passengers, the topic happened to be wildlife. 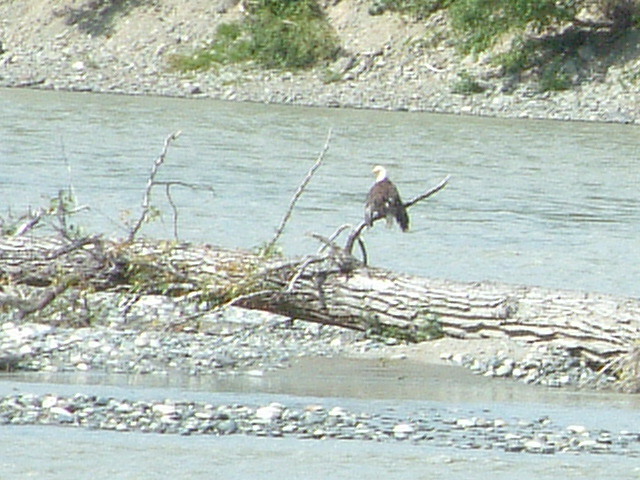 I happened to look at the gravel bar in the river and noticed something large enough to be an eagle, which it was. We soon got to Curry, milepost 248.5. In the past life of this railroad in a less modern age, there was a hotel at Curry which burnt down in the 1950's. 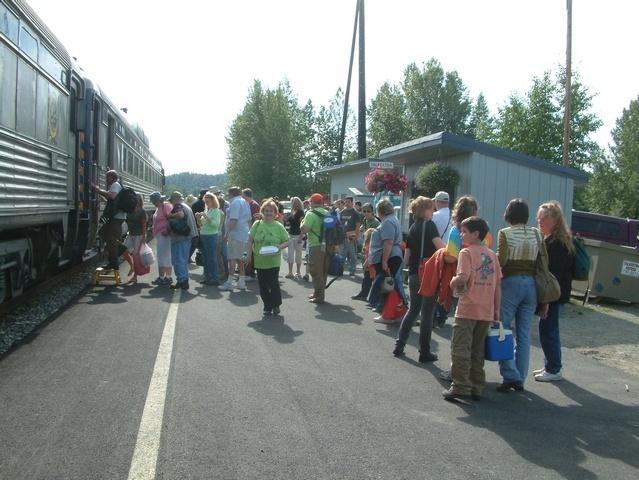 Starting in 2008, the Alaska Railroad will have some type of guided tour available at Curry. 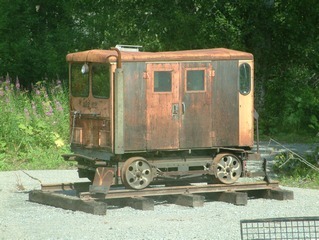 The old speeder car sits by itself on a short section of track. I wonder if this is the same one which was hit by a passenger train as shown on John Combs' Alaskarails web site. The sign on the roof says Curry Alaska Mile 248.5 ARR Elevation 546 Feet. 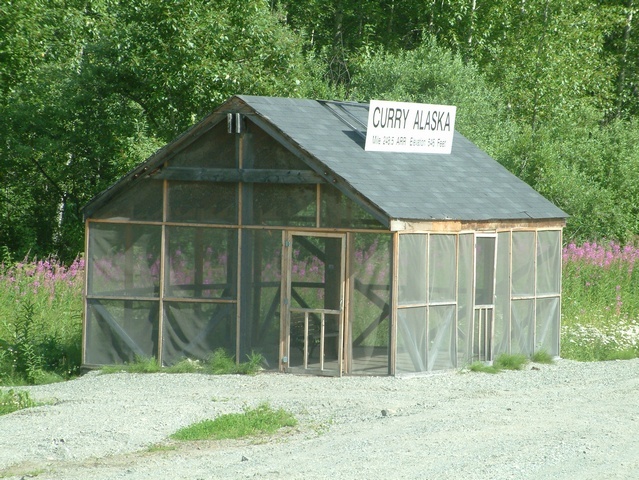 For some very interesting reading about Curry, John Combs' Alaskarails web site has material for you. Another page on the same site is dedicated to Curry. This second link has many other links regarding Curry.